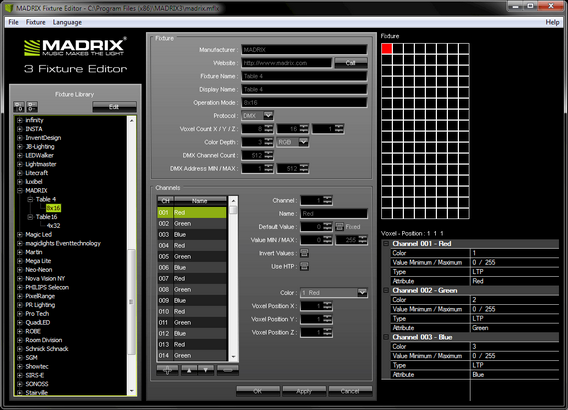 If you open the MADRIX 3 Fixture Editor, you will see that no fixture library is loaded. At first, the tool is empty. The area on the right-hand side of the Fixture Editor serves as a preview while editing. The upper part shows a graphical model of the fixture. The pixel or voxel belonging to the currently selected channel is highlighted with the specified color. Additionally, the lower part summarizes all information [channels, colors, positions, values, types, and names] of this pixel/voxel. The preview is updated every time you edit the fixture profile.